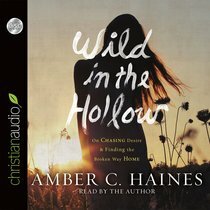 Amber Haines is a woman haunted by God. Like Eve in the Garden, she craved the fruit that she thought would lead her to freedom. But the whispers of temptation led her instead down a devastating path toward isolation, dissatisfaction, and life-altering choices. In her most broken moment, Amber met God waiting for her in the fallout, freely offering her grace and life.This is a story of the God who makes himself known in broken places. In prose that is at once lyrical and utterly honest, a brave new voice takes readers on a windswept journey down the path of brokenness to healing, satisfaction, and true intimacy with God. Amber calls readers to dispense with the pretty bows we use to dress up our stories and instead trust God to take our untidy, unfinished lives and make them free, authentic, and whole. Anyone who struggles with doubt or holds secrets, anyone who feels marginalized or like she is missing something, will find in Amber a sister and an inviting voice back home, into the heart of God. About "Wild in the Hollow (Unabridged, 5 Cds)"